I had been waiting for this lens to be announced for what seemed like a very long time. I needed a replacement for the Canon 600 I had sold after the first of the year. When the new lens was announced I expected a wait of 3 to 6 months before delivery but was pleasantly surprised when one of the first ones Nikons shipped showed up at Bozeman Camera with my name on the box. As luck would have it, I was in Cody Wyoming leading one of my Cowboy and Wild Horse workshops so I had to wait a few days before I could lay my hands on the lens but Saturday morning I was off on the 2 hour drive to Bozeman. When I came into the store the whole crew gathered around to see the new offering from the men in black (Nikon). As I lifted the sleek new designed lens from its hard case, I couldn’t help but smile. Not only was the lens light by 600 F4’s of the past standards but the balance was in the center, not hanging on the far end as I have come to expect from large glass. There are new controls in new locations but you can read about that in other gearhead reviews. It was enough for me to see a real VR switch on the side rather than the old style twist ring and a very smooth tripod collar with no binding when I rotated the lens from landscape to portrait orientation. Happy, I packed up the new workhorse and headed home. I figured I would do some testing off the front deck on some of the local cabins and landscape. I didn’t have a older 600mm F4 to test the new glass against but I have always been impressed with my 400mm F 2.8 VR with the 1.4 extender so that lens started as my test standard. WOW!, did that change fast. In the first series of quick photos I could see there was no comparison. The new 600mm was far and beyond sharper than the past generation 400mm with 1.4 converter when both were mounted on my D810. Still wish I had a past generation 600mm F4 VR to test against the new lens, but when I had tested my 400mm F 2.8 VR with the 1.4 extender against the 600mm of its same generation the results were a tossup. I went to bed impressed at the performance of the new lens. At 0400 my eyes popped open and my first thought was “So, just how good is it in the field?” Since I live only a few miles from Yellowstone and have photographed there for nearly four decades I knew this was one of the worst times of the year to photograph wildlife in the park, but I know the park well and I had to find out how the lens would work for me. 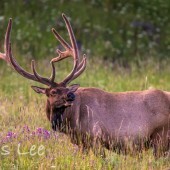 Bull Elk before sunrise, July. Yellowstone National Park. 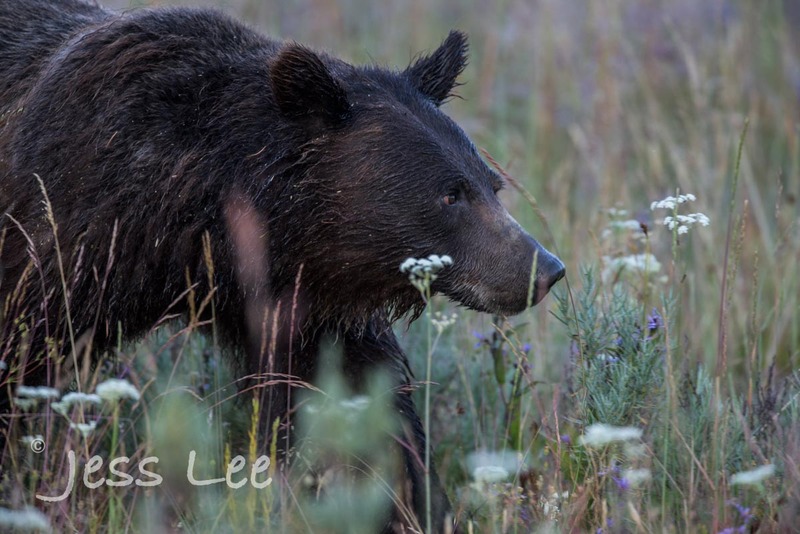 Well it turn out that this morning was one of the best Summer wildlife photography mornings I’ve had in Yellowstone in a long time. 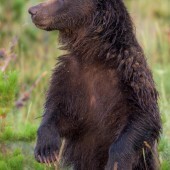 First there was the young Grizzly in the opening image of this post which I photographed with the lens balanced on the edge of the drivers window of the car. Shutter speeds were as low as 1/80 of a second (that only worked when the bear froze to stare off in the distance) but the VR is exceptional. 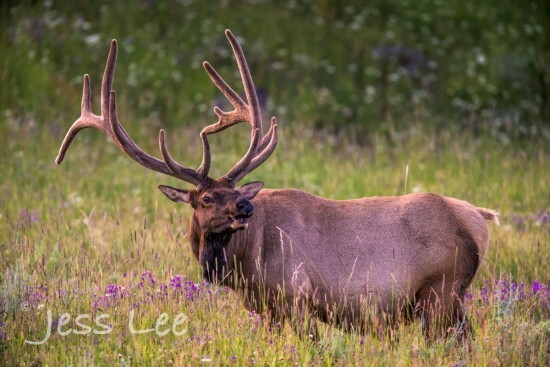 Then there was the bull elk that I though was poising for me before sunrise, but when I looked over my shoulder I realized he was watching a wolf walk the ridge a 100 yards behind me. Of course that distracted me from the elk and I threw the gear in the car and headed off in the direction the wolf was headed. 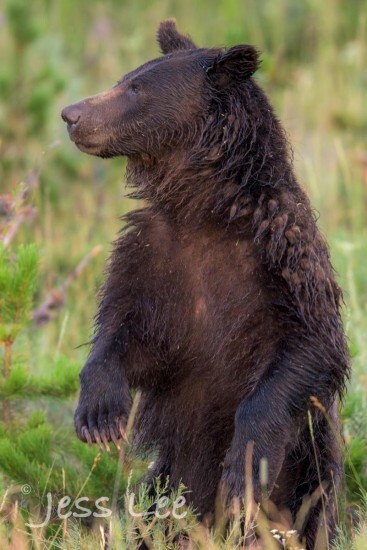 Well I didn’t find the wolf but this little grizzly was close to the road and gave me a chance to again test the VR and the the speed of the auto focus when there is a lot of interference with grass and flowers. Both worked to my satisfaction. 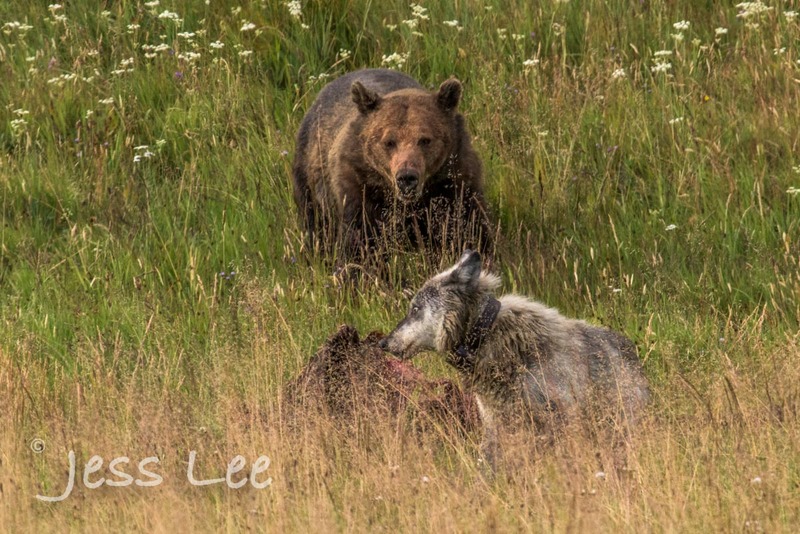 After photographing the bear and a brief search for the wolf it was time to head home and check the elk carcass I had seen earlier in the dark on the way. 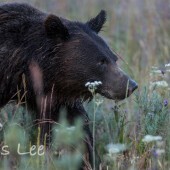 As I drove around the corner I could see a bigger Grizzly in the field near where a dead elk was laying. Pulling off the road I spotted a wolf not to near to the grizzly that was feeding on the elk. I quickly mounted the 600mm on the tripod and found a location where I could best see the carcass. 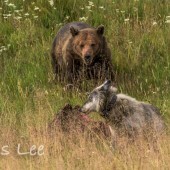 It was pretty far off and I had better shots in my files, however it would still be fun to watch the interaction between the adult grizzly and the wolf. Besides it would give me a chance to see how the new lens would do with a 2X extender. I rarely use the 2x, but what the heck, I know where the delete button is and sometimes actually use it :). 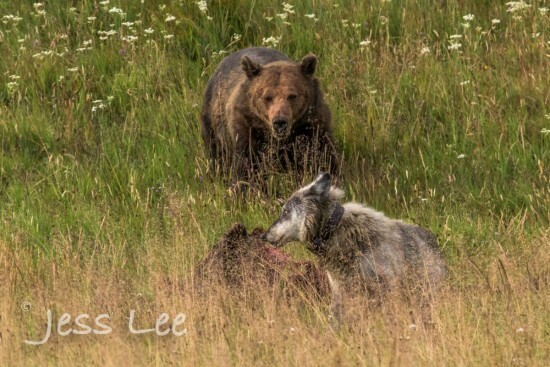 Grizzly and wolf at elk carcass. Yellowstone N.P. The story played out pretty much as I expected. The bear got his fill and went up the hill to sleep. Then the wolf came in to try to get his share but a bear sleeps with one eye open. Wolves run faster than grizzlies and the grass is tall this time of the year so there was only a fleeting test of shooting action with the 2x extender attached to the big lens. That about sums up my first morning with the new Nikon 600mm F4 E FL and the Nikon D810. The lens worked better than expected. I wanted the lighter weight but that was only one of the great features of this lens. VR and Auto Focus seem more than adequate. Balance, handle and controls are just as they should be. I am sure there are little things that can be improved upon, there always are. For me, for now, it will work! This post first originated here and is published with permission. If you have an interesting idea for a guest post, you can contact me here. This entry was posted in Nikon Lenses and tagged Nikkor AF-S 600mm f/4E FL ED VR. Bookmark the permalink. Trackbacks are closed, but you can post a comment.